George Mathias and his wife of 18 years, Diane, were avid outdoors enthusiasts. They were master divers who spent a great deal of time diving around the Great Lakes area videotaping shipwrecks. They also spent almost every winter diving in the warm waters of the Caribbean. They were downhill and cross-country skiers, hikers, and active A.T.V. riders. And they enjoyed traveling with other A.T.V. recreationists to jamborees. Additionally, Mr. Mathias was an excellent hunter and had a passion for hunting caribou in Northern Quebec and elk in the west. As a teenager, George worked with his father as a plumber’s helper after school and on weekends from 1958 to 1961. He assisted his father on various plumbing projects including work on old furnaces and steam boilers, and some remodeling – mainly bathrooms and kitchens. After graduation, George enlisted in the U.S. Navy and served as a fireman from 1961 to 1965. Then from 1965 to 2000 he worked at Detroit Edison Power Company as a boiler operator and turbine mechanic technician. In his spare time from 1965 to 1974, he also did home repairs and renovations at various residential and commercial sites. As a plumber’s helper, George worked with asbestos-containing products such as joint compound and gaskets. He described joint compound as a loose material “much like flour” that would “go airborne and be dusty.” George mixed the joint compound with water, applied the mixture and sanded it down with sandpaper. It created dusty conditions with no way to avoid breathing the dust. It was necessary to clean and sweep afterwards, and sweeping up was a big part of his job. Additionally, George removed and installed gaskets – removing them with a chisel and hammer, as well as a scraper and electric drill. He typically did this while working with furnaces. George said the dislodged material would become airborne and scatter all over the place, and he further talked about how much dust was created by his sanding and sweeping. 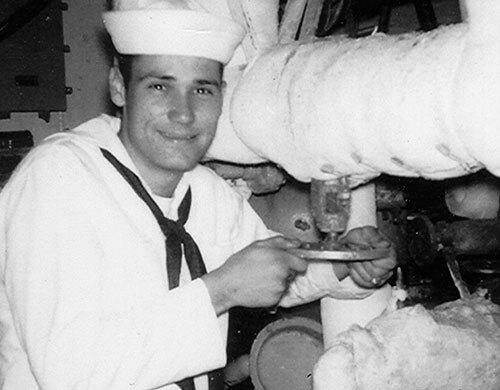 While in the U.S. Navy, George served as a fireman for 4 years aboard the USS Beale and USS Conygham. He referred to his position as the grunt man or cleanup expert. Again, his duties required him to work with and around asbestos containing products and equipment including, gaskets, pipecovering and boilers. He recalled removing old pipicovering with a hammer or handsaw to repair leaks in the pipes and then replacing the discarded material with fresh pipecovering. He said it was “pretty messy” and very dusty with large amounts of airborne debris. After George’s service in the U.S. Navy he went to work as a boiler operator and turbine mechanic technician from 1965 to 2000 for Detroit Edison Power Company. He explained that the boilers were an integral part of the power plant and that it was his job to keep the boilers up and running. They were overhauled every two years, and George described crawling inside the boilers and replacing asbestos containing insulation such as castable insulation and refractory cement. In the early years from 1965 to 1974, he earned extra money doing home repairs and renovations on various residential and commercial jobsites. He often purchased joint compound at local hardware stores for his drywall projects, further exposing himself to asbestos. In October 2000, George was diagnosed with mesothelioma, a fatal cancer known to be caused by asbestos exposure. Soon after his diagnosis and subsequent surgery, he would easily lose his breath doing everyday tasks like getting out of the shower and walking downstairs. It soon became obvious that he and Diane would no longer be able to participate in the outdoor activities they had once enjoyed so much as a couple. Unfortunately, George’s health rapidly deteriorated, and he lost 40 pounds over the course of two months. Less than four months after his diagnosis, he lost his battle with mesothelioma at only 57, on January 31, 2001, leaving behind two adult children from a previous marriage and his wife, Diane. Diane brought suit against the product manufacturers, equipment manufacturers, and asbestos suppliers of the asbestos products and equipment which George was exposed to during his career. As a result of George’s death, Diane was forced to return to work. As she waited for her case to go to trial, the politicians debated an asbestos bill that threatened to derail her case including any pending and future settlements. Her financial security was unstable, but she agreed to travel with Waters Kraus & Paul to Washington, D.C. where she shared her story with her senators from Michigan. The asbestos bill was thrown out and her case has since been successfully resolved.